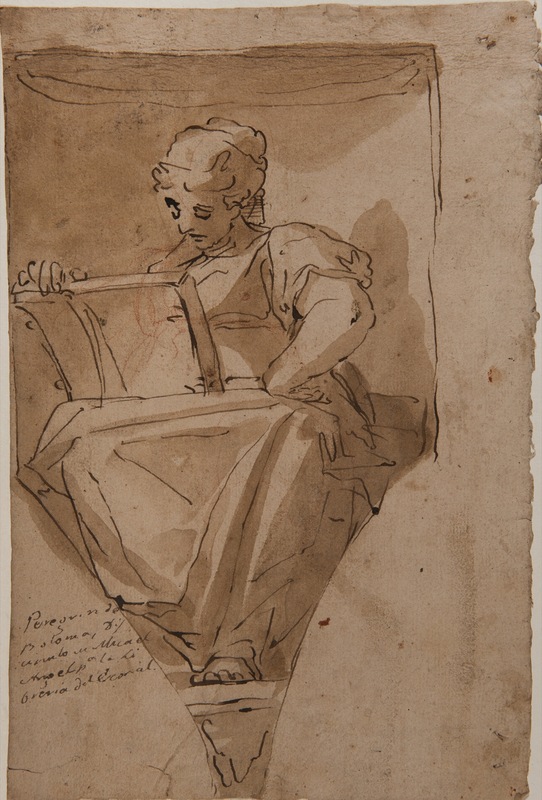 This is an exceptionally beautiful study for a figure of a Sibyl or a Muse intended for a mural decoration. The slightly foreshortened figure is seated in a niche that may be a pendentive or possibly a space between lunettes. Her right hand supports an open book that she consults on her knee. Technically, this pen drawing is executed in a notably synthetic manner using pronounced, rapid and almost geometrical strokes (barely more than straight lines for the folds of the mantle over her knees), which create the figure and the surrounding space. In order to convey a sense of volume the artist makes masterful use of washes, which are also dense and rapid. These form the shadows, while the highlights are produced from the natural colour of the paper. The result is an extremely convincing, volumetric image, to which the strong lighting entering from the lower left also contributes, casting the figure’s shadow onto the interior of the niche. While it is clear that the present sheet reveals all the characteristics of Cambiaso’s style (synthetic, agitated and highly expressive drawings created from a reduced number of lines and with markedly geometrical volumes), we should bear in mind the large number of Genoese artists working in his circle, including Giovanni Battista Castello, known as Il Bergamasco, Fabrizio Castello, Niccolò Granello and Giovanni Battista Perolli. 3 Many of them worked together from 1550 onwards on projects such as the church of San Matteo and the Palazzo Imperiale in Genoa. In addition, stylistic parallels with the present drawing are to be found in works such as the Sala de Psique in the Palazzo Grillo in Genoa, painted by Cambiaso between 1550 and 1555, and the Sala di Ulise in the Palazzo de la Prefettura in Bergamo by Il Bergamasco (1540-1550). 4 Nor should we forget that all these artists would be in Spain over the following years, starting with Castello and his team who arrived in 1566 to work on the decoration of the palace in Viso del Marqués, before entering the service of Philip II. 5 It was for the ceiling in the lobby of that palace that Giovanni Battista Perolli painted a series of allegorical female figures that are notably close to the present drawing. Furthermore, while Cambiaso, who arrived in Spain in 1583, only painted at El Escorial, Il Bergamasco and above all Fabrizio Castello and Niccolò Granello also worked for the Spanish monarch on the decoration of the Alcázar in Madrid and on the palaces at El Pardo and Valsaín (all now lost works). It is therefore not impossible that the present drawing may be a preparatory sketch for the decoration of one of these royal residences. See: Pérez Sánchez, Alfonso E., Catálogo de la Colección de Dibujos del Instituto Jovellanos de Gijón. Gijón, 1969, p. 26, nos. 164 and 165, 270 x 180 mm and 280 x 190 mm, respectively. In the 1993 edition, this attribution to Cambiaso was maintained: Pérez Sánchez, Alfonso E. and Navarrete Prieto, Benito, Catálogo de la Colección de Dibujos del Instituto Jovellanos de Gijón. Madrid, 2003, p. 113, nos.164 and 165. 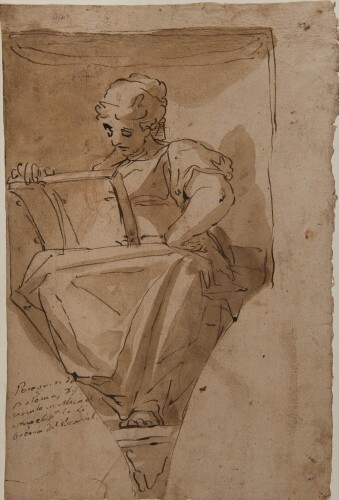 The drawing (224 x 170 mm) was catalogued by Suida Manning (who at that point owned it: New York). She related it to the frescoes for the church of San Michele. See: Suida Manning, Bertina, Luca Cambiaso. La Vita e le Opere. Milan, Ceschina, 1958, p. 190, fig. 245. Fabrizio Castello was the son of Il Bergamasco, while Granello was his stepson. For these artists, see: Rosso del Brenna, Giovanna, “Giovanni Battista Castello” and “Fabrizio Castello” in I pittori bergamaschi dal XIII al XIX seccolo. Bergamo, 1976, vol. I (Il Cinquecento), pp. 377-478 and 491-511, respectively. For Granello and his drawings, which are closely related to those of Cambiaso, see: Newcome Schleier, Mary, “Artistas genoveses” in Dibujos italianos para El Escorial. Madrid, Nerea, 1995, pp. 17-45. Castello also produced allegorical figures for the Villa delle Peschiere, Genoa. For the schemes referred to here, see, respectively, Magnani, Lauro, Luca Cambiaso: da Genova all’Escorial. Genoa, Sagep, 1995, pp. 45-55; and Rosso del Brenna, Giovanna, “Giovanni Battista Castello” and “Fabrizio Castello” in I pittori bergamaschi dal XIII al XIX seccolo. Bergamo, 1976, pp. 443-444, no. 3. López Torrijos, Rosa, “Sobre pintores italianos en España [Castello, Perolli y el falso Cesare Arbasia en el Palacio del Viso] in In Sapientia libertas: escritos en homenaje al profesor Alfonso E. Pérez Sánchez. Madrid, 2007, pp.198-199.